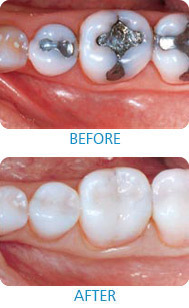 Amalgam Fillings Removal Metal or 'Silver' fillings are an amalgamation of metals including mercury. Amalgam fillings removal needs to be done carefully to minimise the risk of mercury exposure to both patients and staff during amalgam removal. Traditional amalgam silver fillings contain a large constituent of mercury, and exposure to this material can lead to numerous, severe health problems and complications. We are aware of the potential risk of amalgam fillings removal. We provide a comprehensive amalgam removal and replacement service by following extremely strict protocols to ensure the removal and disposal of mercury is correct and safe. As part of the service, our patients will be provided a thorough amalgam removal consultation, and during the consultation process, we discuss what is involved and answer any questions you may have regarding mercury, amalgam fillings and your health. Contact our friendly team on 09 489 7574 today for more information or to make an appointment. Omar, Thank you so much for the lovely Veneers you fitted, they have given me new lease for life.